Our main business is dollhouses, but we do have other offerings as well. Be sure to check out our other products! The outstanding characteristics of our wood products are that they are easy to assemble and offer excellent quality for a reasonable price. 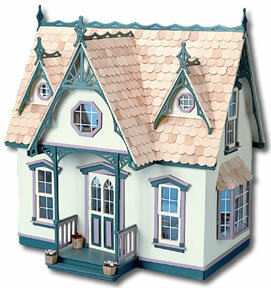 The dollhouses are fully scaled 1" = 1' with large rooms for ease in decorating. We have found that these kits are suitable for various markets: youths (ages 12 and up), adult hobbyists, and both beginner and advanced miniature collectors. The houses offer a good balance of simplicity, design, and detail. They can be assembled and enjoyed as is, or embellished with additional trim by the more serious dollhouse enthusiast. Corona Concept's kits contain all the pre-cut plywood and plastic window parts needed. They feature an easy tab and slot assembly requiring no nails, screws, or tools. Any wood glue or a hot melt glue gun can be used to assemble the kits in just hours. Each kit contains easy to read instructions which refer to schematic drawings showing where each piece of wood can be located along with illustrated diagrams showing detailed assembly. If the instructions are followed, frustration disappears and you are left with hours of building enjoyment.